Smarter, faster, and more powerful than ever. The world's favorite cookie is your new favorite Android release. Test your apps for compatibility with Android Oreo. Just download a device system image, install your current app, and test in areas where behavior changes may affect the app. Update your code and publish, using the app's current platform targeting. 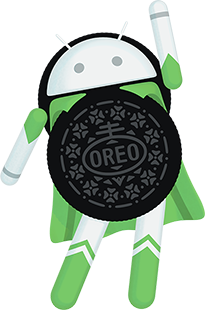 Run Android Oreo on your test device. Easy steps to reach compatibility. System changes that may affect your app on Android Oreo. Android Oreo gives you many new ways to extend your app and develop more efficiently. Target Android Oreo (API 26 or 27) and extend your apps with the latest platform capabilities and APIs. Highlights of features and APIs for your apps (API 26). Highlights of features and APIs for your apps (API 27). System changes for apps targeting Android Oreo.